Wow its that time again already.. Monthly Favourites, this month i have been using more skin items due to the cold weather coming, my skin getting a little dry and a recent awful break out in spots..(urgh..honestly if anyone knows of a miracle spot clearing product please save me and let me know, because its just getting embarrassing now!) i haven't had bad break out like this in a while and have no idea why. So getting on with the monthly favourites of October..here's the line up. As mentioned i have terrible skin at the moment and this has done wonders at drying out any spots and reducing the size of them, this is the first face mask from Lush i have used and i have really enjoyed it (and so did my partner ha) i love the fact its all fresh natural ingredients and that you have to keep it in the fridge, so when you slap it all over your face it also has a lovely cooling effect. I have ran out of this now and this pot lasted about 3 weeks which is the perfect amount of time as it has an expiry date, i would buy this again as it helped my spots and gave a brighter look to my skin when washed off after 10 mins, it smells like peppermint chocolates and has Cocoa butter, Linseed and cocoa powder, peppermint, spearmint and sandalwood oils. I bought this last year in the winter time and i seem to use it more this time round (maybe I'm getting braver to wear bright colours?) this is a very popular shade from the collection in the blogging world and i can see why its a beautiful plumb/Burgundy/raspberry colour perfect for A/W . 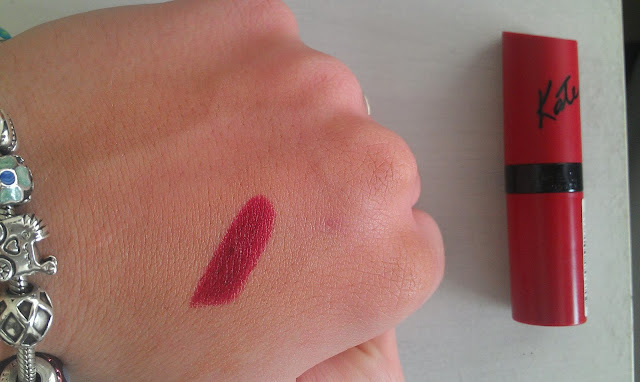 I love to wear this with a neutral eye as i do with most bright lip colours, it lasts a good few hours before fading and has a matte finish that feels lovely and velvety on the lips, it can be drying as alot of matte lipsticks can so i just add a bit of Elizabeth Arden's Eight Hour Skin Protectant to my lips... and I'm good to go. This little beauty deserves a post review of its own ( to come shortly) so i wont ramble too much on this, but this is such a brilliant multi tasking product, you can use it for almost anything. I have been using this on my cuticles as they have been pretty dry recently and i ran out of my Lush Lemmony Flutter so used this and it seems to have made my nails grow stronger and they look really healthy again, i have also used this on my sons dry skin patches to soothe them and make them less itchy and this oil has literally fixed the problem and its even been used on taking the sting out of any grazes and cuts. These work as a duo for me, and i love using these so much i recently bought the coconut scented ones too..
i have heard alot about the beautifying oils from The Body Shop but never got round to trying it, then i spotted these in the sale and BAM they where mine. I love using this as part of my night time pamper sesh, i just find it feels all relaxing and luxurious to use oils before bed and helps me get a better nights sleep. The bottle the oil comes in is great because it doesn't let the oil just pour out, and it just sinks in the skin so easy without leaving it greasy and sticky like some can, and i really don't have time to sit there rubbing it in for ages, i then follow this with a spritz of the body mist to keep the lovely sweet, nutty comforting smell locked in longer. It leaves my skin lovely and soft with a subtle healthy sheen and i love it, hence why i bought some out of the sale a few days later ha. This little product has also been helping to cover my facial demons (aka spots) it has great coverage and you only need a small amount, so this is why the pump on this thing is so annoying as it dispenses too much product and makes it hard to control how much comes out so you can waste some. I also use this under my eyes and to cover any redness, this has got to be the best concealer i have used to date just because it covers so well, lasts all day and gives a lovely un-cakey finish. 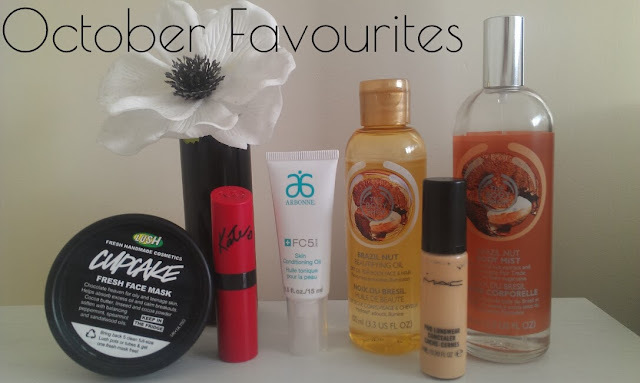 I would love to see your monthly favourites so pop a link below..
Have you tried any of the above? What are your thoughts?